As a Mom, I am always reminded that I need to stay on track. It’s just not always that easy! But that is where stocking up on protein-rich eats and lots of water keep me energized. And when I do find extra time, I love seeing what I can whip up to reward us all with in the kitchen! To which the new Pure Protein Plus Bars were perfect for! Case in point? A nice stretch of cooler weather had me craving apple pie and graham crackers. I don’t judge the yearnings people. But I do realize that the best way for me to keep the world turning on this end is to make sure I give my body what it wants most, in the best ways. So I get at least 8 hours sleep. I drink lots of water. I avoid wheat. And I try to amp up the nutritional value of my recipes whenever I can. Meaning if I was baking up an apple pie, I was leaving out added sugar and flour. 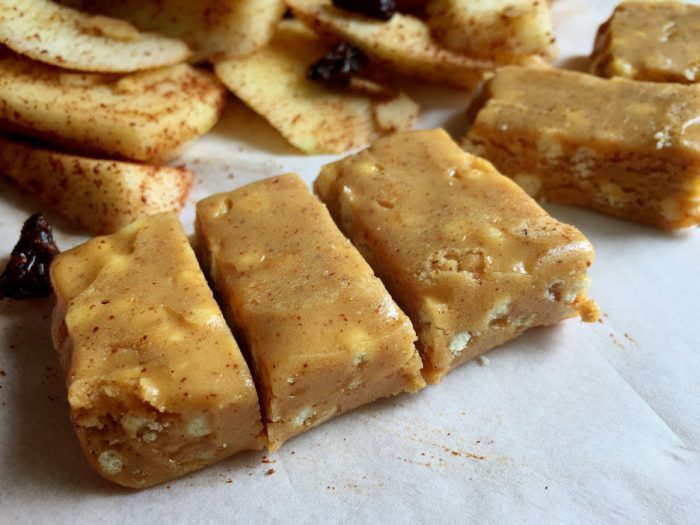 I was also going to chop up and add in a Pure Protein Plus Apple Pie Bar to add to the pie filling and crumb topping. 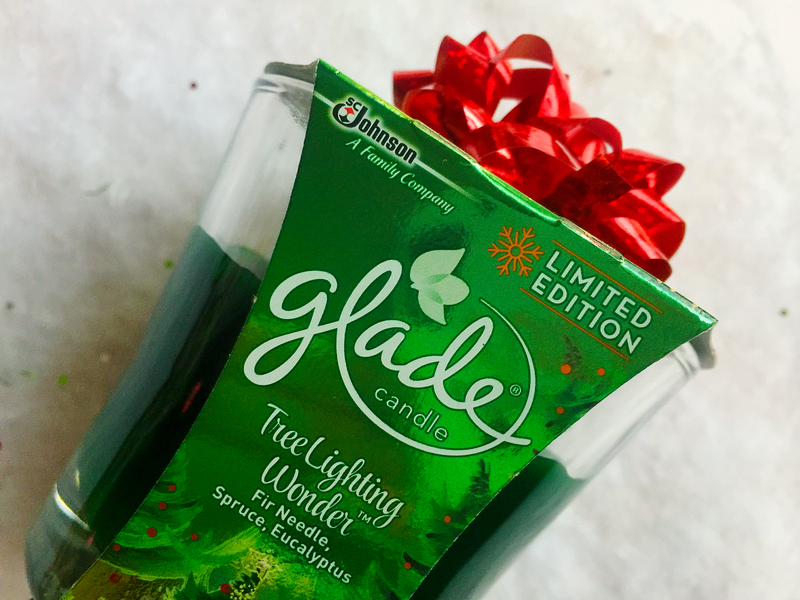 Made with real apple pieces and no artificial sweeteners, this gluten free go-to would be perfect for adding in a sweet, cinnamon and caramel essence. 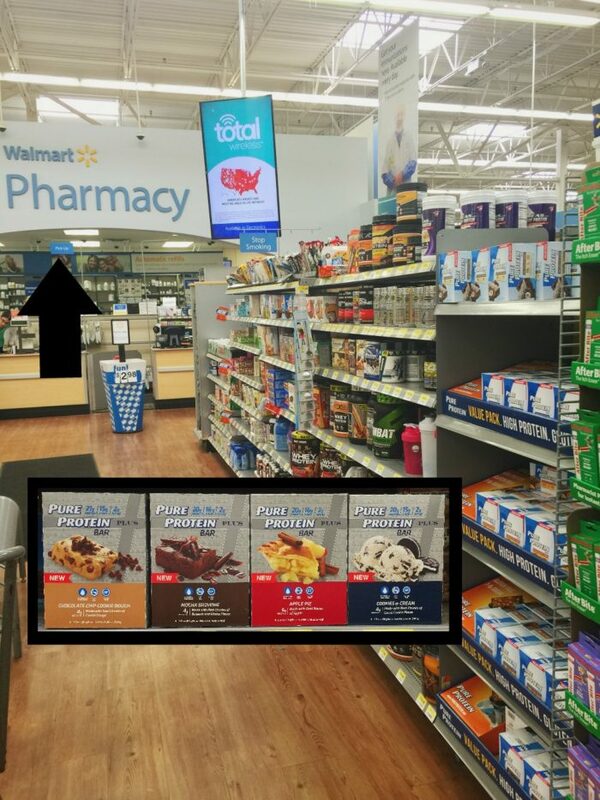 So on a recent trip to Walmart I swung by the Pharmacy section to check out the four new Pure Protein Plus Bars. 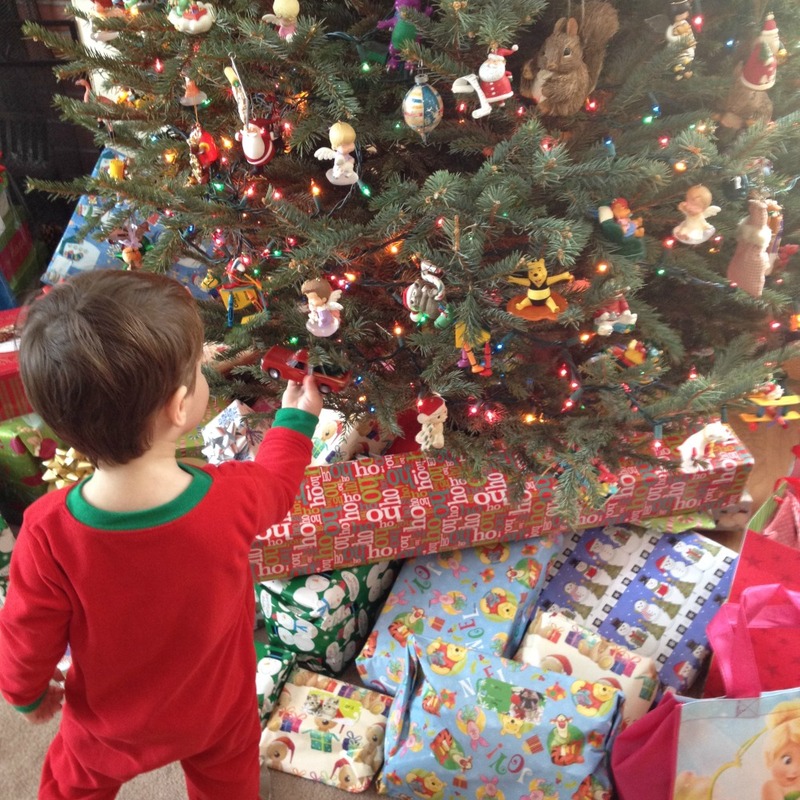 Use Ibotta to earn cash back when you shop! 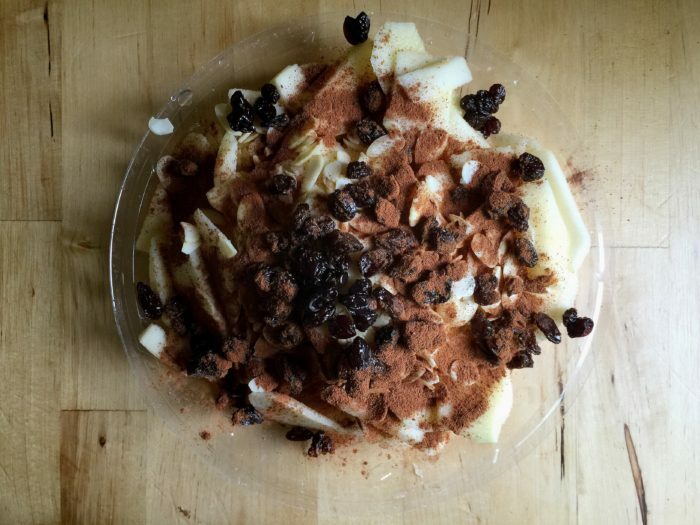 Besides the Apple Pie variety, they have Mocha Brownie, Cookies and Cream, and Chocolate Chip Cookie Dough. Beyond the high protein and fiber values, I was impressed they were GMO-free. As well as the fact these bars use stevia to sweeten, yet still remain low-sugar. Flash-forward back to present day, and I’m preheating the oven to 350° degrees. 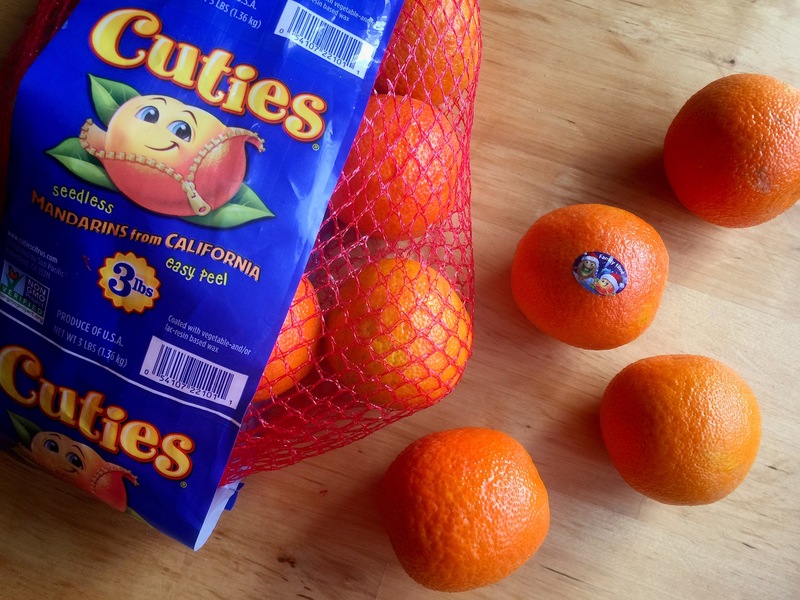 I’m also pulling out the following: 5-6 Golden Delicious apples sliced, ¼ cup baking raisins, ⅓ cup sliced blanched almonds, 1½ tsp of apple pie spice, and ½ a lemon. Yes. That’s all there is to it. As for a crust, that’s where my favorite ready-made graham cracker crust will come into play. This will be a crustless apple pie however, so I’ll set this aside for now. However, I will pull out the clear plastic inner shell to use next. You know, the one that protects the crust? Well…it actually does a whole lot more than that! If eating well keeps me on track, any means of doing less dishes helps the crusade even more. 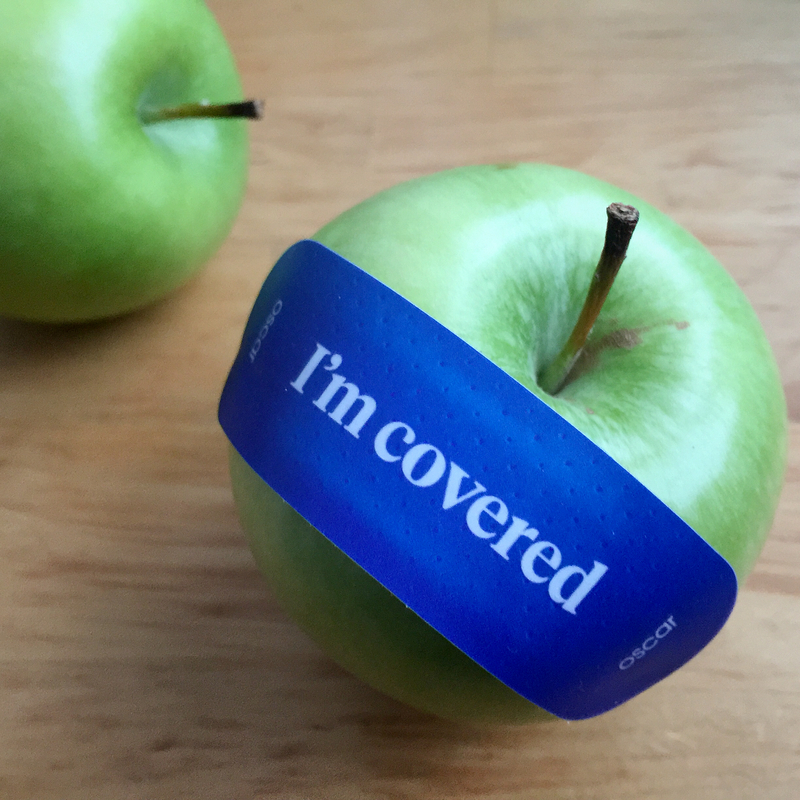 Not only does using this inner plastic shell protect the crust prior to you buying it. Most know that it also flips to protect the pie you’ve made for later. Another handy use? 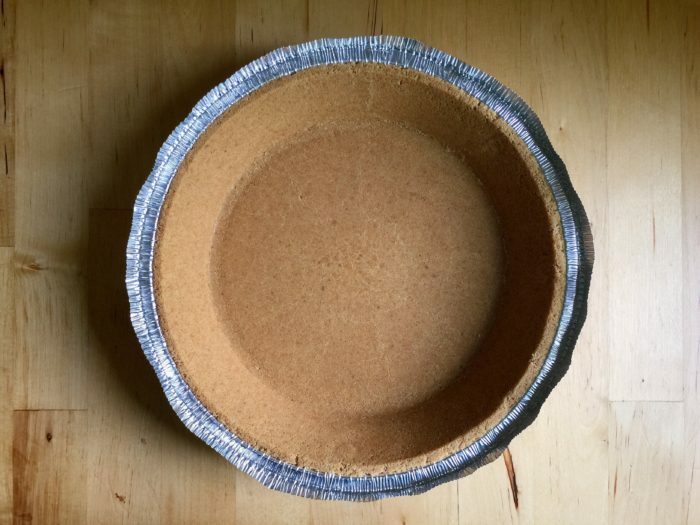 Used as a bowl, it allows you to see exactly how full your pie will be. Because not only am I a messy baker, I’m an ample one. To which a bowl always has room for more. 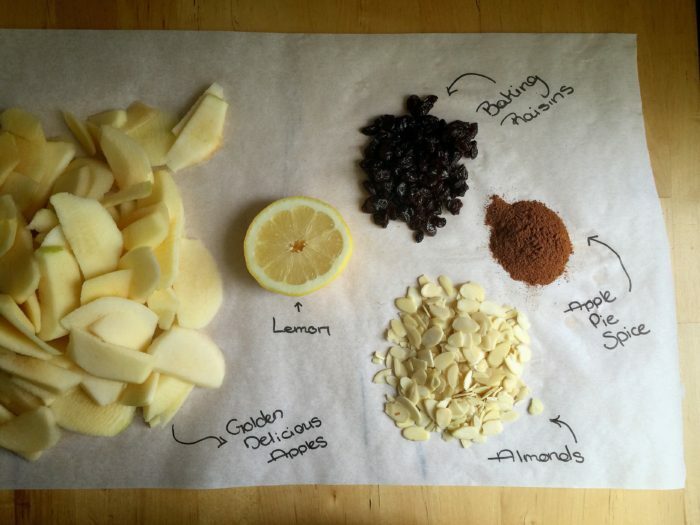 This is also a convenient visual when you’re halving a recipe, or in my case, creating one. 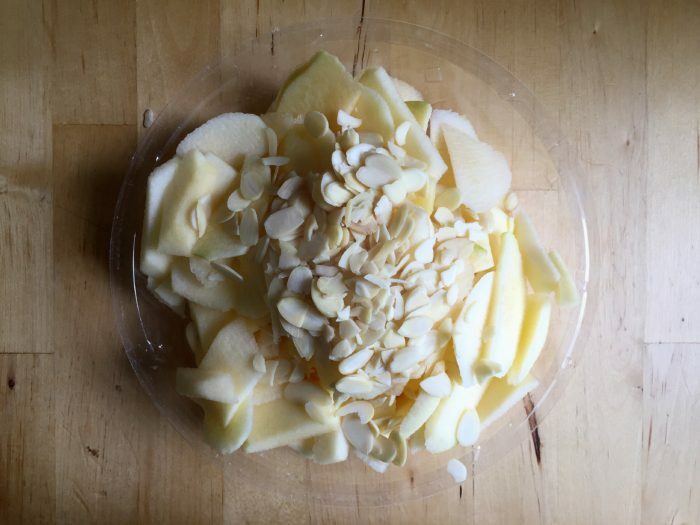 Here you see 6 sliced Golden Delicious apples and ⅓ cup sliced blanched almonds. Next, we’re breaking out the Baking Raisins. A larger, plumper raisin, it’s more moist for baking purposes. I added one serving size, a ¼ cup. Then I squeezed in the juice from the halved Lemon. Now follow this up by adding the 1½ tsp of Apple Pie Spice. 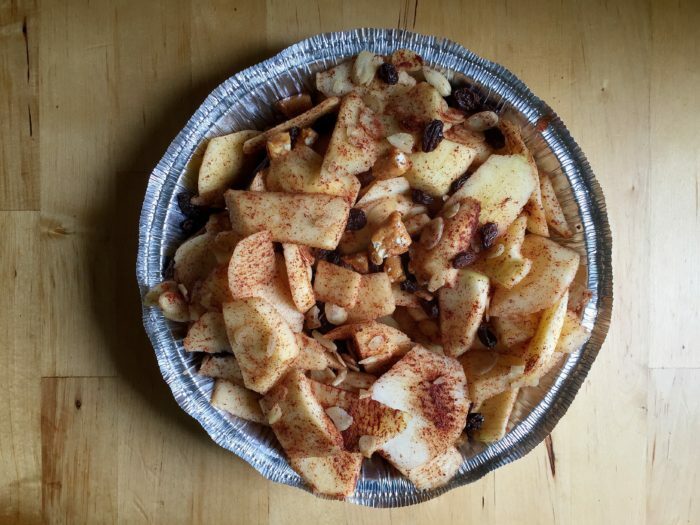 I tossed these pie contents on a piece of parchment paper to mix and entirely coat the apples in spice. Then I set the pie filling aside. Now I was ready to add 1 Pure Protein Plus Apple Pie Bar to the filling and graham cracker crumb topping. 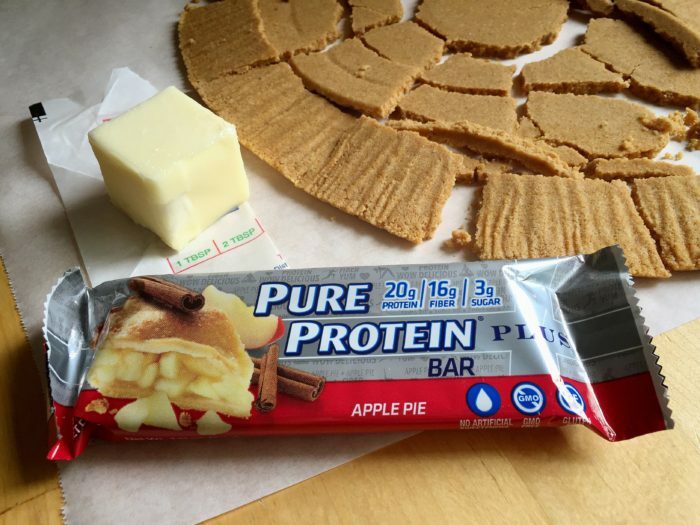 Using a knife, I began to chop up the Pure Protein Plus Apple Pie Bar. I added ¾ of the bar to the pie filling. This will enable it to slowly melt throughout the pie for added fiber and protein. I used the remaining ¼ of the bar to coat in crushed graham cracker that had previously been lining the pie pan above. Then added 2 tbsp softened butter to the broken graham cracker crust for a streusel-like topping for covering the apple pie filling. Lightly butter your now empty pie pan (or using your own baking dish), and transfer in your apple pie filling. 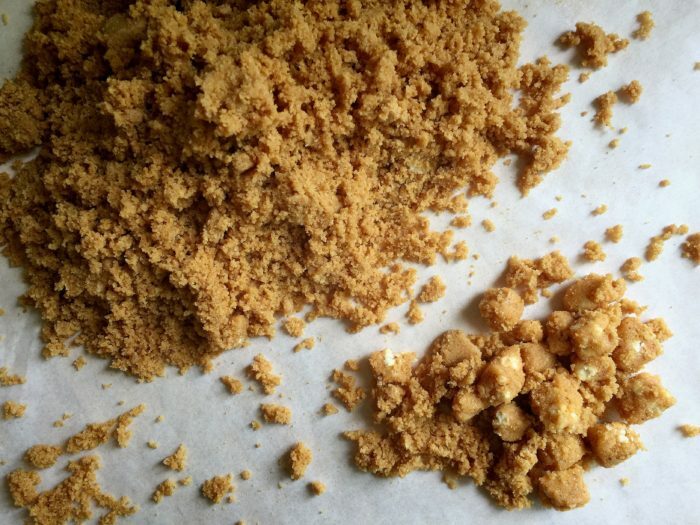 Then top with your crushed graham cracker crumbs. 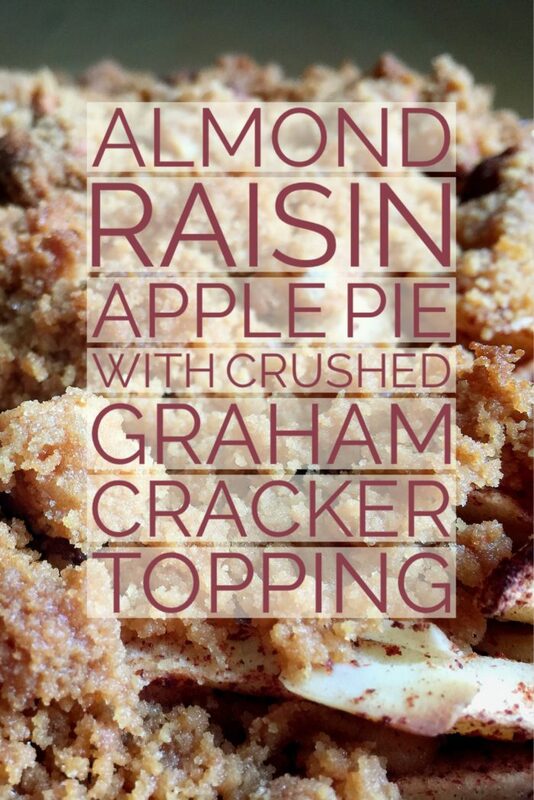 While I used all the graham cracker crumbs on top, this is certainly one aspect you can use to taste as well. I finished the raw pie with sprinkling the remaining ¼ chopped Pure Protein Plus Bar on top as well. And placed this pie into a preheated oven for 18 minutes. This pie’s Golden Delicious apples will remain defined, sweet, and with slight crunch. With the added raisins you won’t even miss the fact we omitted added sugar. 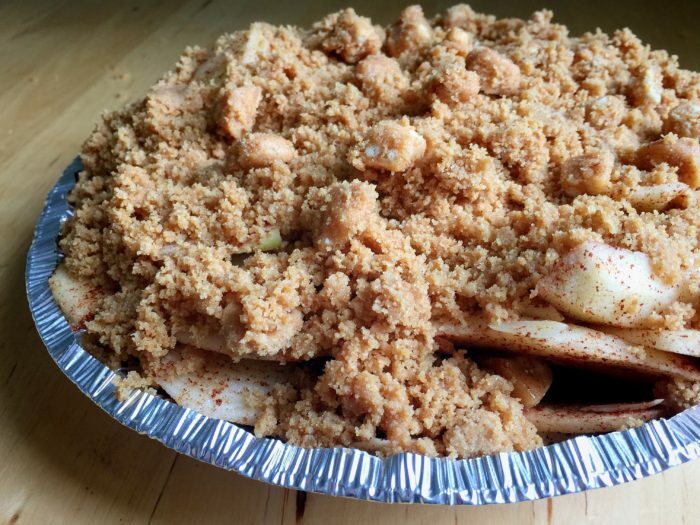 And the Graham Cracker Crumb topping makes this an upside down crustless apple pie a treat! Now that you have your eye fed with this tasty nibbler, are you ready to win big? 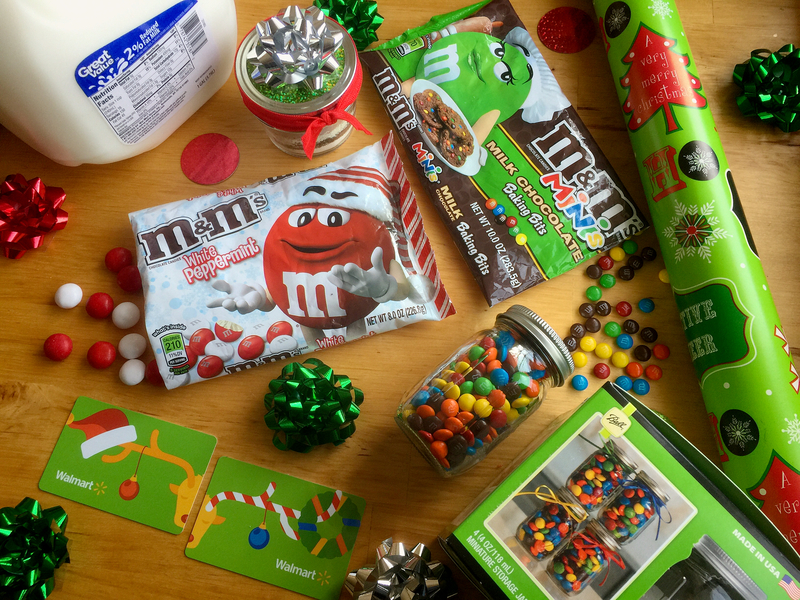 Then make sure to enter the Pure Protein Plus Bars sweepstakes to keep your days on track. 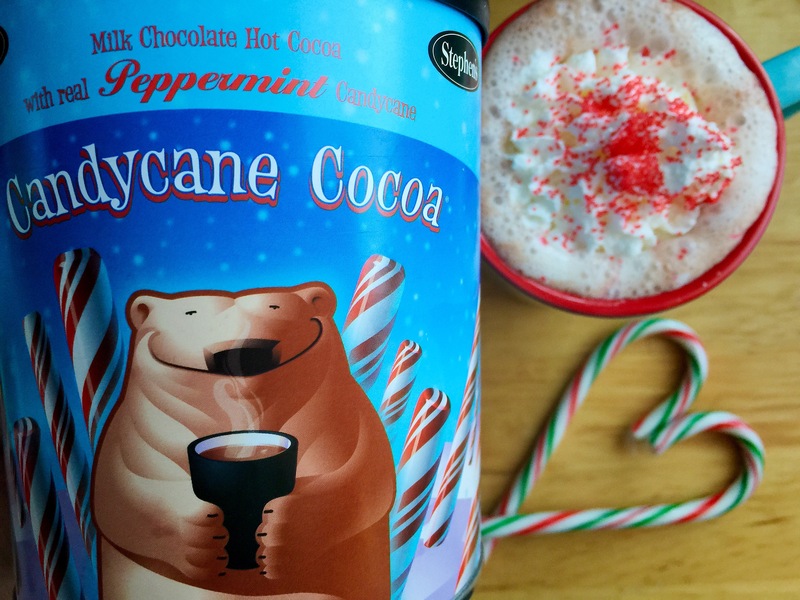 And don’t forget to come back and let me know how this recipe turned out for you too! Turn that apple pie upside down for a crustless treat that will leave everyone eager for more! Preheat oven to 350 degrees and lightly butter pie pan. 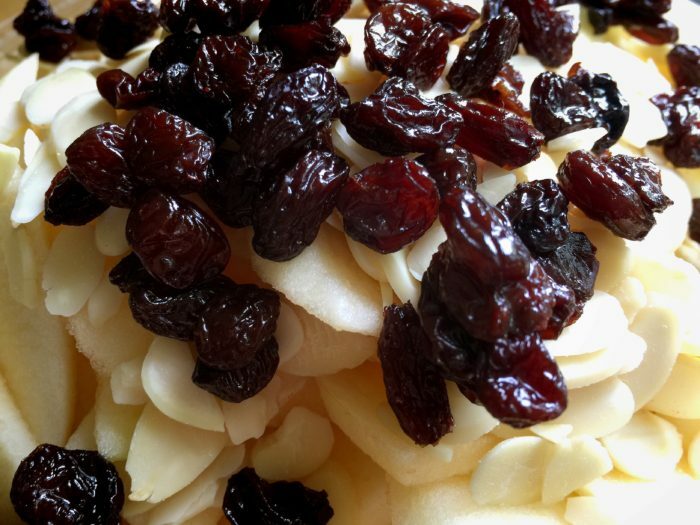 Combine apples, almonds and raisins. Squeeze in juice from ½ Lemon. Toss apples to evenly coat with spice and additional pie fillings. Dice ¼ of a Pure Protein Plus Apple Pie Bar and set aside for topping. Continue dicing remainder of Pure Protein Plus Apple Pie Bar and crumble into pie filling. Now combine premade graham cracker crust with 2 tbsp softened butter. 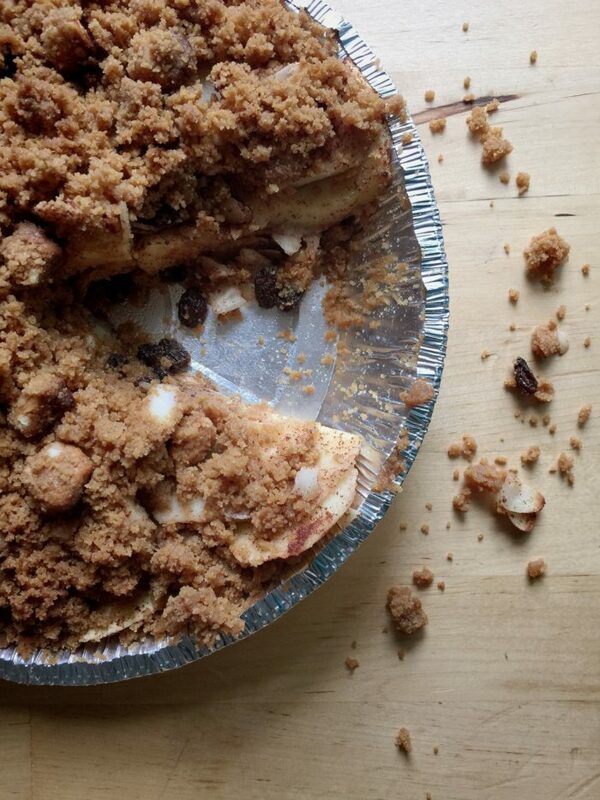 End consistency should resemble a crumbly streusel-like texture. 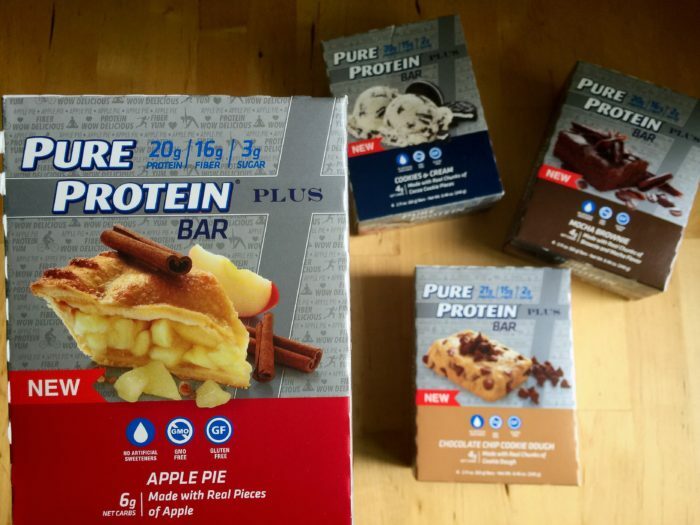 Sprinkle on top of apple pie filling, then use remaining ¼ Pure Protein Plus Apple Pie Bar to accent top of pie. Bake in preheated 350 degree oven for 18 minutes.